Had a late night craving for something sweet, but had nowhere to go? Cookie Bookie to the rescue! Cookie Bookie is providing options for the munchies - that is freshly baked options delivered right to your door! So how does this work? Quite simply, call 973-732-0012 during their hours Thursday through Saturday from 6pm- 1:30pm. Choose from Chocolate Chip, Oatmeal Raisin, White Chocolate Macadamia Nut, Sugar Cookies & White Chocolate Coconut Almond Cookie. They also have MONSTER Cookie bars and brownies. Make an order of at least $8 (that's 6 cookies), cookies are freshly baked and then delivered. Below is an approximate delivery area based on Cookie Bookie's delivery description: The furthest north is Park Ave, furthest south is Pennington St., furthest west is Bergen St. and the furthest east is Merchant St.
Cookie Bookie is the brainchild of Djalna (the d is silent) McSween. When Djalna decided to leave her life as a successful interior designer she fondly remembered her college-go-to in Philadelphia, Insomnia Cookies, and had her a-ha moment. Without much pause she worked on some recipes and made her thoughts a reality and launched Cookie Bookie in Newark in September 2012. A little unsure of how the idea would be received, Djalna is always pleasantly surprised when someone new calls in. Her biggest fans are the fraternities at NJIT and her biggest seller is the chocolate chip cookie. 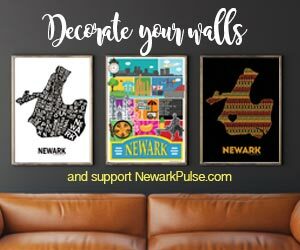 A secret tip for NewarkPulse readers... all cookies are measured and weighed to ensure consistency in cookies, however on Saturday nights, Djalna admits to baking bigger cookies to get rid of the dough.